Cedar Lake in Northwest Ontario, Canada, offers a wide variety of water colors and structural elements to chase muskies throughout the entire season; however, there’s something magical about being alone on the water in early fall. Jim Saric and Musky Hunters Charlie Buhler and John Mich join Cedar Lake Lodge owner Al Rempel to reveal the secrets to catching Cedar Lake muskies. No matter where you chase muskies, there are three keys to consider if you want to be successful: focus, execution and time management. 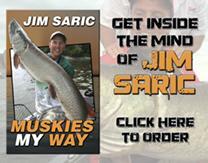 Jim Saric and Trophy Hunter Tom Sullivan demonstrate how these three keys can greatly impact your musky trip. After the spawn, muskies often cruise shallow flats in search of food. Early in the season, these flats have scattered weed cover making it difficult to hold muskies in one location, so they are constantly on the move. Jim Saric and Musky Hunter Charlie Buhler cast and troll shallow flats in search of early summer muskies. Lake St. Clair is a musky factory and in mid-summer, casting and trolling the open water is the most effective approach. However, when Mother Nature brings giant winds, it’s time to change the approach and fish the adjacent rivers. Jim Saric and Pro Guide Spencer Berman discuss an alternative approach to fishing for summer muskies — fishing the St. Clair River. Lake Nipissing and the French river are known for one thing: giant muskies. Every year some of the largest muskies in North Amercia are caught from these waters. Jim Saric, Trophy Hunter Tom Sullivan and Musky Hunter Mike Baron troll the French River and Lake Nipissing in search of a late fall trophy. The Winnipeg River in Ontario Canada, flowing north from Lake of the Woods in Kenora towards Manitoba, is an incredible musky fishery. Besides the Winnipeg River there are some great lake fishing opportunities in this system. Jim Saric and Musky Hunters Scott Schuster and Steve Smith detail their approach for catching muskies in the lakes as well as the river. Depending on where you are located within the musky range, summer can arrive at significantly different times and also produce extreme temperature changes. First Jim Saric and Musky Hunter Managing Editor Steve Heiting fish early summer muskies in Northern WI under conditions which seem much more like opening day. Then Jim and Pro Guide Spencer Berman troll Lake St. Clair in the middle of summer after a massive cold front. The Kawartha Lakes are located approximately 100 miles northeast of Toronto, Ontario and consist of a series of lakes within the Trent-Severn waterway. Jim Saric, Pro Guide Taro Murata, and Musky Hunter John Cowan offer a number of summer strategies for fishing the Kawartha lakes. 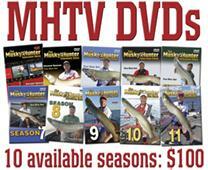 In summer, evening and approaching storms are two prime situations when you can expect increased musky activity. First Jim Saric and Musky Hunters Charlie Buhler and John Mich try to make the most of the situation with an approaching storm. Then Jim and John Mich fish prime evening conditions on Lake of the Woods in Ontario. There is something special about musky fishing in fall. Temperatures are dropping and the muskies are feeding, as the season rapidly approaches its end. Jim Saric and Musky Hunter John Mich offer the traditional live bait and artificial lure approach for late fall muskies in Northern Wisconsin. Lake of the Woods in Northwest Ontario Canada is the dream destination for many anglers. Afterall, with the nickname “Lake of the Muskies” who could resist a trip? Jim Saric and Legendary Guide Bill Sandy explore multiple fishing options on Lake of the Woods, while battling a series of extreme weather changes over a 24-hour period.